Speaking about the look, Regina Cassandra says that the stylists had put in a lot of effort to get the look right. “It took the styling team more than 24 hours to get it right. My stylist Shanti, tattoo designer Mo and Vijay, did extensive research before zeroing in on this look. The makeover took place around the end of July, and it took a lot of effort to keep it a secret for so long! The most difficult part was to hide my look at public appearances (laughs). I couldn’t wait for my new look to be revealed!,” Regina was quoted as saying by a report in DC. Speaking about her role, Regina says,”When director Prashanth narrated the story to me, I could visualise my role and was hell-bent on playing it. I knew that I had to go for a drastic makeover. 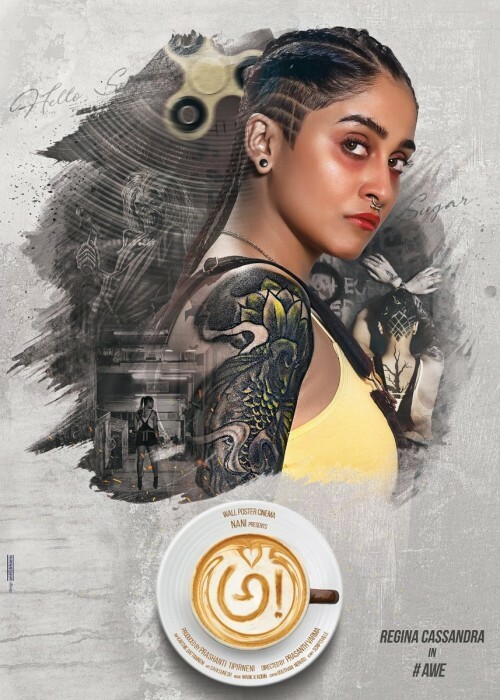 I’m glad the look has surpassed expectations.” Besides Regina’s look in the film, the makers have so far revealed the first look posters of Nithya Menen and Eesha Rebba which have created a huge excitement around the film. With the posters creating so much excitement around the film, this sure will be the most anticipated for in 2018. Nani had said recently that when he first heard the script, he was very excited. “Prashanth narrated the story to me and I was thrilled after the narration. I asked him about producers of the film and he said he hasn’t found on yet, but will manage it somehow. That’s when I realised that this story needs a good platform and decided to produce it myself, and told Prashanth the same,” Nani said in a video message he posted on his social networking page. With such stellar star cast, AWE is certainly the most anticipated for film in South Indian cinema in 2018. Nani himself is busy with his acting commitments and a release lined up in couple of weeks, MCA, manages to take time out for production and yet balances everything in a fantastic way. Nani’s MCA is slated to be released on December 21st, 2017. Regina Cassandra will also be seen in a Tamil film directed by Vikram Prabhu titled ‘Party’. The teaser of the film was released by the makers a day ago and the film promises to be laugh riot. ‘Party’ stars Jayaram, Jai, Premgi Amaren, Sathyaraj, Ramya Krishnan, Regina Casandra, Sanchita Shetty, Nivetha Pethuraj, Nasser and Chandran among others. Taking a hilarious dig at the demonetisation, ‘Party’ seems to be a fun-filled story with huge humour quotient with a trademark Venkat Prabhu style. Starring top actors like Sathyaraj, Ramya Krishnan, Jayaram and Nasser in important roles, ‘Party’ seems to be a laugh riot and Tamil movie-buffs would be waiting for the release of the film. Regina will also be seen playing the female lead role in ‘Nenjam Marappathillai’ which is being directed by ace filmmaker Selvaraghavan. The film is touted to a thriller but Regina Cassandra says it not a thriller and is a dark movie. Produced by Gautham Menon jointly with P. Madan, the release of the film has been rescheduled many a times till now but the actress doesn’t seem to have been affected by that. “The wait for Nenjam Marappathillai doesnt frustrate me. The funny part is that every time a new date is announced I feel as excited as I did when the film was supposed to release,” says Regina Cassandra in an interview to a news agency. Talking about director Selvaraghavan, Regina Cassandra says that she has learnt a lot of things from him. “I wont say Selva is a demanding director, but a perfectionist. He knows exactly what he wants. A lot of people actually told me that its going to be difficult working with him. But I never kept that in my mind, and I am glad that I didnt,” adds Regina.